There’s truly no place like New York during the holiday season. From the parades and shopping to the holiday performances, it’s hard to be in the city in December and not catch at least a little of the holiday spirit. But it’s the light displays that really set New York City apart from the rest. These five displays are perennial favorites for a reason. If you didn’t see the Rockefeller Center Christmas Tree, were you even in New York? After a ceremonial tree lighting in late November, the Christmas tree becomes a major tourist attraction throughout December and into early January. You simply have to see the 78-foot Norway Spruce covered with more than 45,000 LED lights – it’s spectacular. But there’s more than just the tree at Rockefeller Center. Take a spin around the ice skating rink or check out the festive holiday decorations. 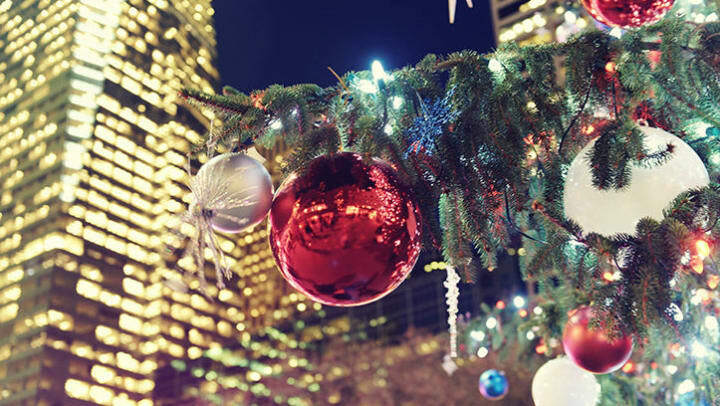 Even if you just stop by while you’re out holiday shopping, the Rockefeller Center tree is a definite must-see. As long as you’re visiting Rockefeller Center, you should check out the rest of the displays on Fifth Avenue. The major department stores go all out for the holidays with over-the-top displays, and with an easy walk down Fifth, you’ll be able to catch a lot of them. Start with Bloomingdale’s, then hit Barneys New York, Bergdorf Goodman, and Tiffany & Co. You’ll pass St. Patrick’s Cathedral, decked out in its holiday best, then Lord & Taylor. Your last stop? Macy’s, the biggest department store in the world, and the place that started the tradition of holiday window displays. A quintessential New York holiday experience, Dyker Heights Christmas Lights definitely lives up to the hype. The residents of this neighborhood in Brooklyn start putting up their elaborate holiday decorations the day after Thanksgiving, so the optimum time to visit would be mid-December. If you want to see the lights up close, plan to dress warmly and walk the few blocks with the most lights. Otherwise take a car or even a bus tour. For kids and adults alike, a trip to visit the Holiday Train Show at the New York Botanical Garden can be magical. Featuring models of New York City landmarks made entirely out of natural materials – twigs, seeds, dried leaves, even rose petals – this exhibit is sure to spark your imagination. For adults only, the New York Botanical Garden hosts special Bar Car Nights, so you can check out the exhibition after dark and with a warming cocktail. There are in fact two different menorahs in New York in the running for the title of World’s Largest Menorah. The first is in Manhattan across from the Plaza hotel, which was declared the World’s Largest in 2006 by the Guinness Book of World Records. The second, in Brooklyn at Grand Army Plaza, is actually 6 inches taller, but a Jewish court decreed it could not use the “World’s Largest” title because the Manhattan menorah had used it first. Controversy aside, lighting ceremonies at both menorahs are must-see events featuring New York personalities and Jewish delicacies.